Hello, friends! It's Andrea with you today sharing a card that's on trend. 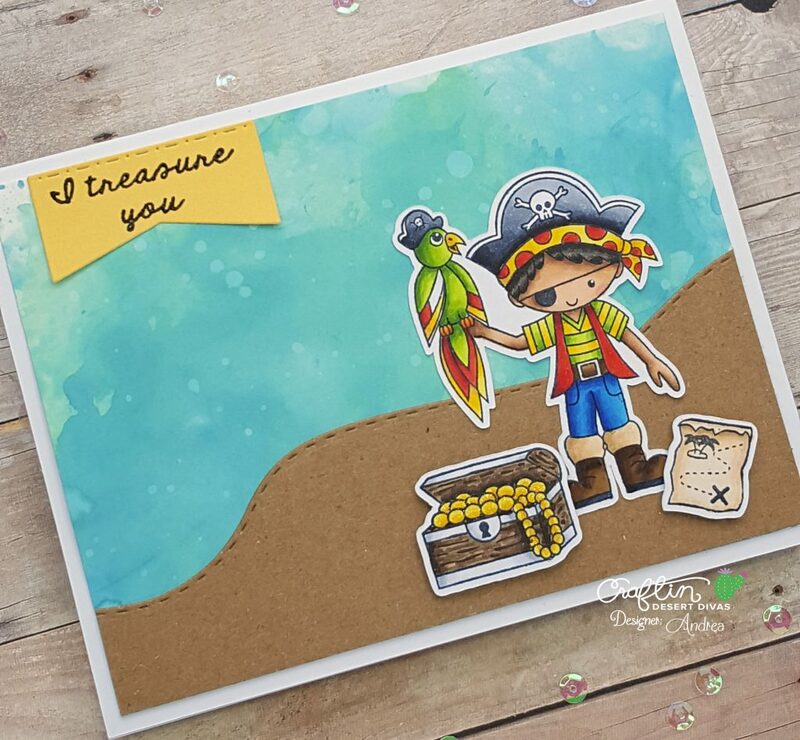 Pirate and space stamp sets are hugely popular right now, and Craftin Desert Divas has you covered with their Adventure Awaits and Adventure Land stamps. I used some of the pirate-themed stamps from those sets on my card today. 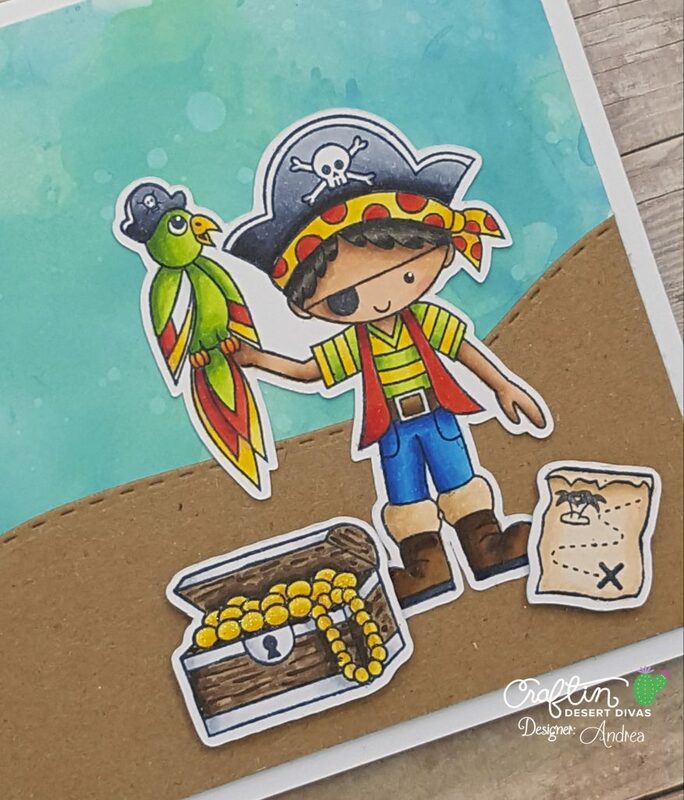 Isn't that little pirate so cute?! To have him holding the parrot in his hand, I first stamped the parrot and then masked it before stamping the boy. All of the images were stamped with Memento Tuxedo Black Ink, colored with Copics, and cut out with my ScanNCut2. To create the watery background, I ink-smooshed Broken China and Cracked Pistachio Distress Oxide Inks onto Bristol Smooth paper. I partially dried each layer with my heat tool, and after I was happy with the layers, I flicked on and blotted off some water. For the beach, I die-cut some kraft paper with one of the Outdoor Landscape Dies and adhered it to my water, which I then glued onto a white card. 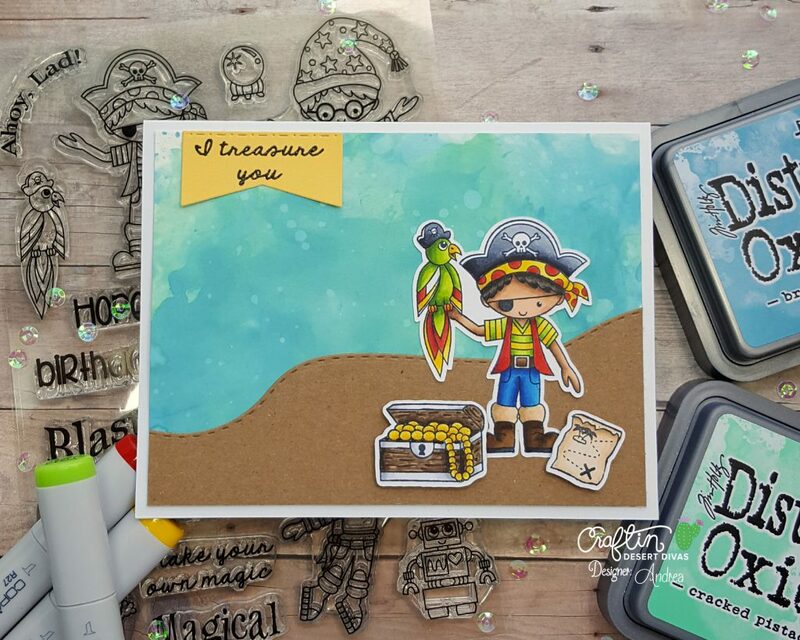 I added my colored images to the card, popping up the treasure chest and map with foam tape. I heat-embossed a sentiment from Adventure Awaits onto a yellow banner die-cut with one of the Fancy Frames Dies. Some Zig Wink of Stella on the treasure finishes the card. 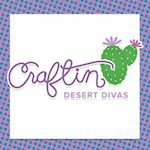 As this is my last post for Craftin Desert Divas, I'd like to thank Tara, the owner, for this wonderful opportunity and experience. I have loved being on the design team and working with Tara and all of the other wonderful ladies. 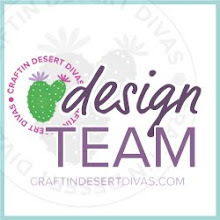 Craftin Desert Divas has some of the best stamps and dies on the market, so while I may not be on the design team, I will certainly be using and buying their products! Thank you for sharing this journey with me, and I hope you have a wonderful day! It's Your Birthday Go Wild!